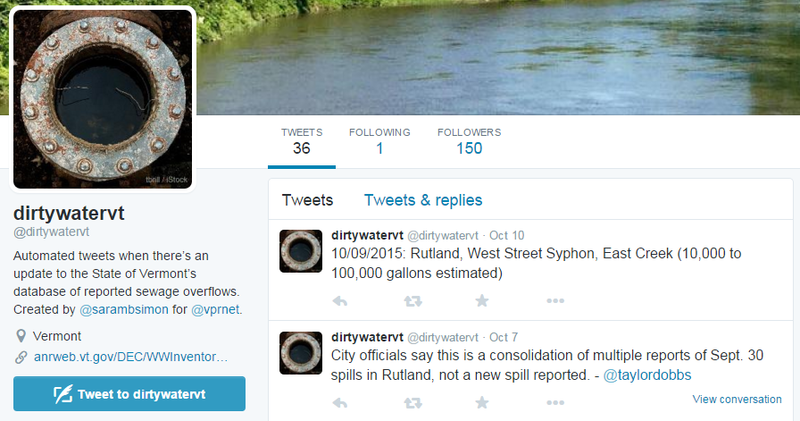 VPR Web Developer Sara Simon created @dirtywatervt to help bring information about sewage spills to the public. As digital reporter for Vermont Public Radio, one of the things I spend my time doing is checking a number of government websites for new story leads. It’s generally not rewarding work but on the occasions there’s something new to be found, it can make for some good scoops that don’t require well-placed sources or anonymous tips. Vermont hospitals, for example, are inspected by the state of Vermont to ensure compliance with Centers for Medicare and Medicaid Services standards, and inspection reports are released online at the website of the relatively obscure Division of Licensing and Protection (within the Department of Disabilities, Aging & Independent Living within the Agency of Human Services). Those reports can contain important information, like the fact that a patient was killed by an accidental, nurse-administered ketamine overdose at the state’s largest hospital and the hospital took seven weeks to change problematic drug administration practices. That story could’ve been written in the spring soon after the inspection report was posted online, but I wrote it in July because that’s when I happened to have time to check the website that keeps track of those reports. If you’ve been a reporter for any length of time, you probably have or have had a few favorite obscure government websites where you hunt for story leads or new filings. But given that news reporters in Vermont (and in general) don’t tend to have much free time, it’s not good for our audience to have public information that depends on being “found” in order to become truly public. It’s 2015. Let’s fix that. Another site I frequently check is the state’s website that tracks sewage spills reported to environmental officials. Our web developer, Sara Simon, created a Twitter bot that checks that site twice per day and tweets about any new spills that have been reported. (Here’s her code.) I was interested in the tool as a reporter, because Twitter easily allows me to set up push notifications for any user I follow. With the bot, I know I don’t find out about a sewage spill more than half a day after it was reported. The agency is required by law to post public notice of sewage spills, but a public notice is only worth anything if the public notices. Now, instead of actively seeking out information that is difficult to find and only sometimes new, people can simply follow a Twitter account that only provides information if it’s new. But you don’t have to code a public-information-spewing bot in order to free up buried information. Just keep in mind that most people probably don’t spend their days looking for the things we spend our days looking for, and it’s easier than it’s ever been to share those things with the public and other reporters. Last week, I saw this story from VTDigger that mentioned that same report in its lede. Reporter Erin Mansfield wrote a story that put the report in the context of a statewide issue, including interviews with top officials and links for deeper reading (VTDigger has been doing a great job covering the state’s mental health system this summer). The story did a great job using public information as a launch point for a wider story – it provided a great example of public service journalism that uses public documents in context to make it both more powerful and more informative for the public. Wanted to let you know that I found that report based on your tweet. I didn’t end up citing you because I couldn’t find an article on VPR to link to. Erin didn’t link to VPR’s coverage of the report because there wasn’t any – beyond my single tweet. VPR got scooped on a good story because of my tweet, and that’s great. We can be more creative about what the “it” of that sentence really is. It doesn’t have to be fully digested stories, it doesn’t have to be at our website and it doesn’t have to be coming out of a broadcast tower. It is information. This doesn’t mean we should start ignoring journalism or journalistic principles by tweeting PDFs all day without doing interviews or going into the field, but it might mean reporters being more generous about favorite obscure website for story leads, or making Twitter bots that make the information on your favorite obscure website for story leads less… obscure. The point is: We’re working towards a more informed public. There are more members of the public and more sources of public information online than ever before. The problem isn’t that the information is lacking, it’s that there’s no facilitator bringing it to the public where they are. Serving in that role doesn’t always have to be traditional journalism, but it’s almost always a journalistic act. I’m putting this here because I think Serial’s success has perked up a lot of journalists’ ears (especially if they are, like me, in radio) and made them think about what they can take from Serial and apply to their own work. Media critic (and my former professor) Dan Kennedy posted a commentary on his blog by journalist Brian C. Jones that makes an interesting argument that Serial isn’t journalism because it launched before the journalist involved – This American Life’s Sarah Koenig – knew what the outcome would be. Jones’ problem, he writes, is that Koenig is one episode away from the conclusion of her look into the 1999 murder of Hae Min Lee and it seems likely she won’t have a “He did it!” or “He’s innocent!” conclusion to cap it all off. Not doing so, he argues, just causes a lot of harm to everyone involved in the case and doesn’t really accomplish anything. Therefore, he says, it’s voyeurism and not journalism. I disagree with the argument that this disqualifies Serial from being journalism. While I have sympathy for the family of the victim and the defendant with respect to the pain of being in the spotlight, I think Jones’ criticism is off the mark. To condemn a journalist for scrutinizing the work of police and prosecutor, and for the discomfort that’s caused, is to condemn accountability journalism. Accountability journalism is never comfortable when done well, and it shouldn’t have to be. Public officials – both the law and society in general agree – are and should be subject to greater scrutiny. As to the harm caused to Adnan by digging into this case – Jones is right, it must be difficult. But (guilty or not) he was convicted of killing a girl. Is that not more harmful to his reputation or emotional health than anything Koenig ever could do? Does the outcome of her reporting (or lack thereof) somehow retroactively change the calculus here? Journalists spend every day asking difficult questions and making people uncomfortable. Much of the time, especially for investigative journalists, this never pans out. That’s okay. But is it suddenly not journalistic work if they then publish their findings, painstakingly taking the time to note all the things they’re not sure about. The only real difference between investigative reporting and what Koenig has done here is that the things that don’t pan out generally don’t go public, because it would require far too much ink or air time or pixels to say “we checked this out and there are a bunch of caveats but we still have questions.” But this is a podcast dedicated to exactly that, and Koenig openly acknowledges the weaknesses in what she’s found as well as the emotional difficulty involved in this digging – the criticism mentions Koenig’s own disclosure as evidence against her. Correction: An earlier version of this post misidentified Jones.